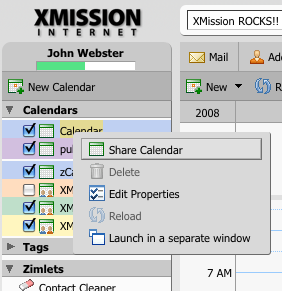 XMission’s Zimbra Suite makes it easy to share your calendar: simply right click on the calendar you want to share and click on “Share Calendar”. The “Share Properties” pane, show below, is where you can share your calendar with internal users on your domain, external users, and/or grant access to your public calendar. 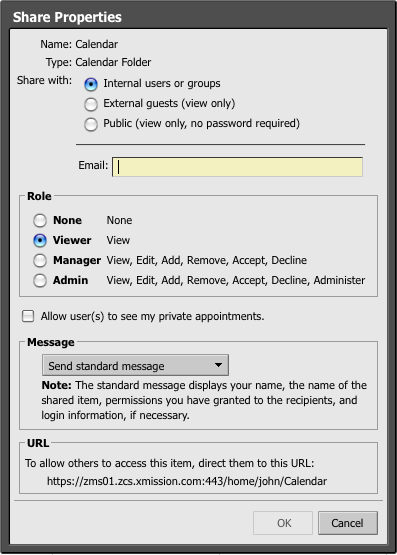 In addition you can grant access as view-only, or allow complete (Manager/Admin) access. Manager and Admin status allows others to make changes on your calendar. 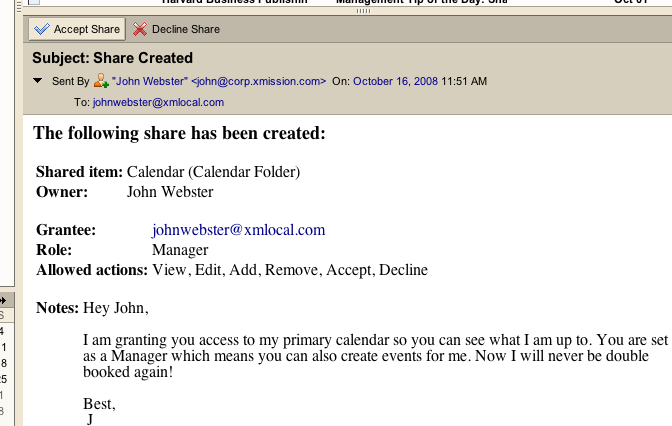 Enter the email address of the individual(s) you want to share your calendar with. Set share recipient “Role” appropriately. You can even send a note with the calendar share which can be very useful. Important: setting a calendar to “Public” means it is wide open to the world and anyone with the URL can download your calendar .ics file or view it in .html format. There is another quick way to get the web address of your calendar, simply right click and choose “Launch in a separate window” (see image below). Your selected calendar will pop up in a new browser window. Copy, paste, and share that URL as needed. Use this URL to embed your calendar in websites. Calendars set to “Public” view also offer RSS subscriptions; viewers simply click on the RSS icon in the browser navigation window to subscribe. 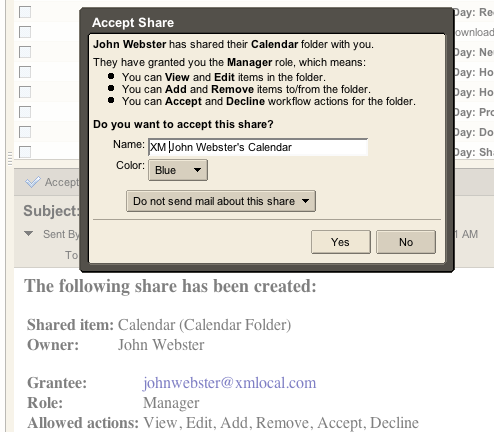 Those are the basics of sharing your calendars using the XMission Standard and Premium Zimbra Suites. It is pretty simple and intuitive. This page was last modified on 25 September 2018, at 16:40.